What Is the Difference Between Domestic & Wild Hermit Crabs? It's easy to understand the difference between your pooch and his wild cousin, the wolf, or cats and their wild counterparts, such as tigers. Hermit crabs are a different story. About the only difference between your pal living in his crabitat and his wild relatives is where home is. Technically, there aren't really "domestic" hermit crabs -- at least not like cats and dogs are considered domestic animals. 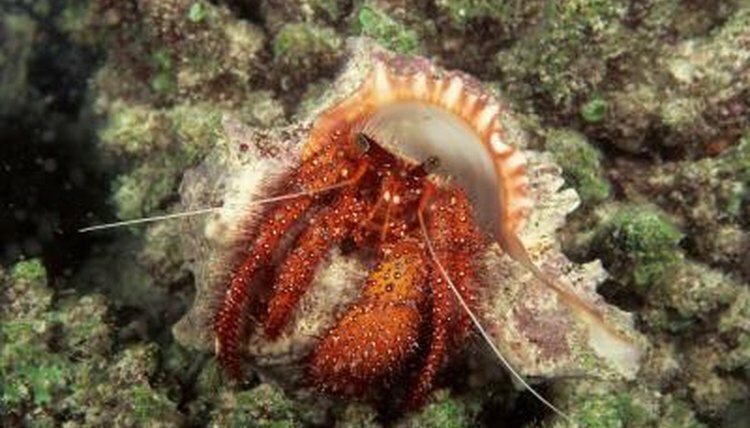 Land hermit crabs come from tropical areas of the western Atlantic, the western Caribbean and the Indo-region. Wild land hermit crabs are collected from their native habitats in Florida and the West Indies and sold as pets. Henry and the rest of his crab buddies in his crabitat at some point were living on a shoreline, living a wild life. The only physical difference between the guy in your crabitat and the one relaxing on the beach is their ability to reproduce. After mating in the wild, a female hermit crab carriers her eggs against her abdomen for about a month before they hatch. When it's time for hatching, Mrs. Crab will run to the ocean to release her eggs, which burst open when they make contact with the water. Domestic crabs, living in captivity, can't complete the hatching process, so they can't reproduce. The needs of domestic and wild hermit crabs are the same: they need a warm, humid environment that allows them to breathe and keep their gills moist. All crabs need shells to protect their soft, fragile abdomens, and whether in captivity or in the wild, crabs will engage in shell fights if they fancy a shell that's already taken. You may have seen this same behavior in your crabitat if Henry has decided he prefers his roommate's shell. Crabs in the wild will improvise if they can't find a suitable shell, using bottle caps, liquor bottles and other debris that offers protection. Whether he's home on the beach or in his crabitat in your living room, a hermit crab likes company and will spend time engaging other crabs, particularly at night. Where a hermit crab lives makes all the difference. In the wild, a land hermit crab is an omnivore, eating whatever she can find, including vegetation, fallen fruit and whatever washes ashore. In his crabitat, Henry can eat just about anything, including fruits, vegetables, meat, nuts and seeds. Because he's still really wild at heart, he shouldn't eat processed foods.